Swoopy Island curves gently, offering a spacious place for entertaining, chatting with the cook, and for wide open views of the outdoors. The new owners of a home built in the 1990s saw great potential in a first floor that had been built with a series of smallish rooms that each served a purpose, but didn’t lend themselves to the way the family wanted to use the house and didn’t take advantage of the home’s views. In the photo below you can see a TV room that had been constructed between the living room and kitchen. Connecting the spaces was a dark hallway that housed an ill-placed bar. 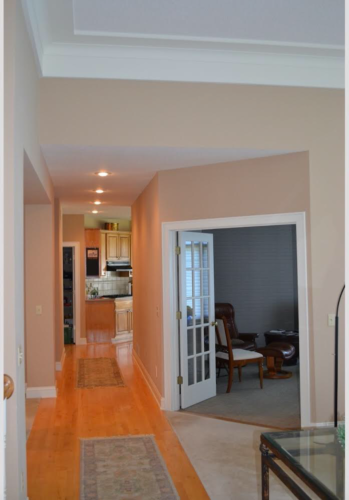 The size and location of the hallway also minimized the laundry room and made the back entry tight. Before: an angled-entry TV room separated the kitchen and living room, and made the hallway between dark. By inserting a large island to be used for cooking, prep work and seating/entertaining, we could tie the rooms together yet separate the business of cooking from entertaining. To add interest and to keep it from looking like a runway, we tried a gently curved form, and the plan nicknamed “Swoopy Island” was born. After: the new island cuts through what had been the TV room and provides a bridge between the kitchen and living room. 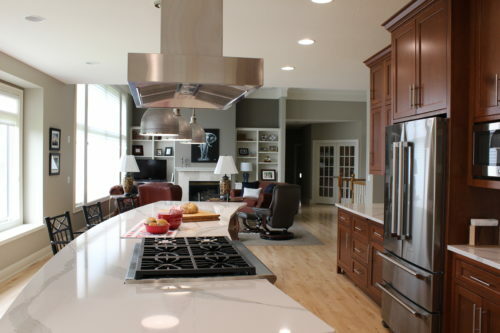 The island sports 16′ of cooking, prep work and entertaining/seating space. Topped in a marble-look Cambria quartz top, it can endure the rigors of baking and cooking, and look beautiful as a place for buffets or casual dinners for family and friends. 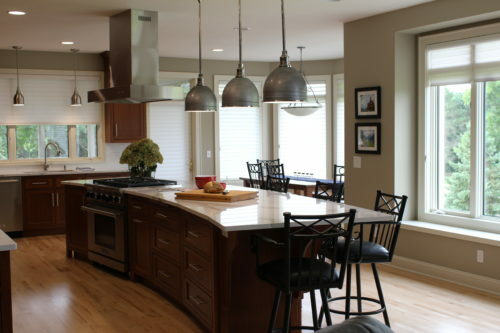 Large-scale light fixtures and an island hood fix the island to the ceiling, anchoring it and keeping it from feeling like just a piece of furniture in a large room. Custom cabinetry throughout provided the flexibility and opportunities for most flexible storage, display and organization. To ensure the kitchen is tidied during cooking, there are two trash roll-outs: one next to the dishwasher and another in the island by the range. Although it may seem like overkill, having trash and recycling disposed of right away reduces kitchen cleanup time. A buffet area was created at what had been the entry to the hallway. 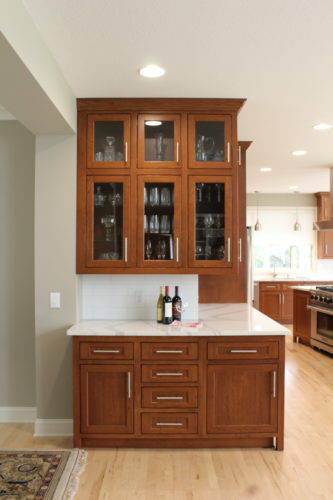 High-skilled cabinetry work includes the inset doors, beautiful stained finish, and details such as this display cabinet that opens on both sides. 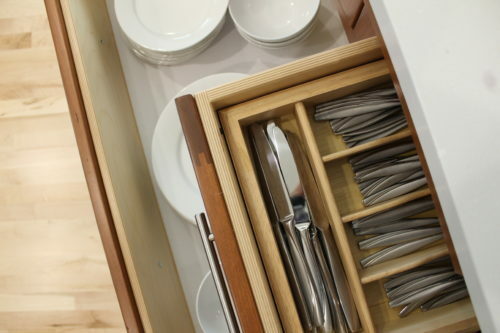 Drawer and cabinet accessories make setting a table and unloading the dishwasher easy for the family and guests who want to help. 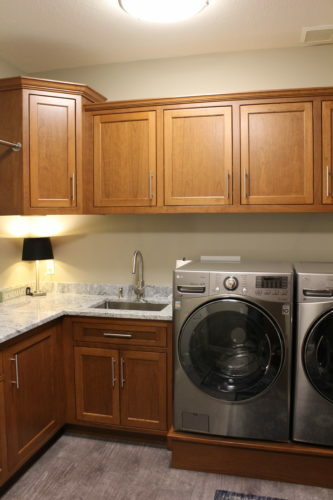 In addition, the small laundry room got expanded by incorporating what had been the hallway/bar. A large closet, folding counter, cabinetry and mudroom bench/cabinets were added to provide storage and a drop-off place by the garage entry. The existing laundry was reworked to include a large closet, bench/coat storage and a beautiful area for storage and clothes care. A walk-in pantry connects the back entry and the main kitchen, creating a drop-off place for staples after grocery runs. 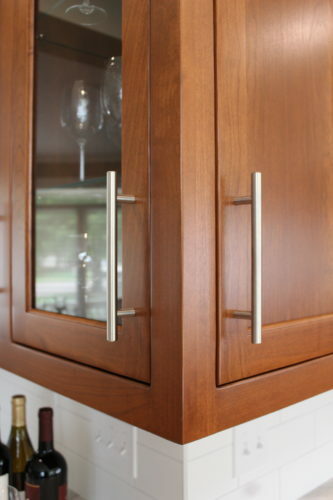 Accessed by a beautiful patterned-glass sliding door, it is a lovely, functional asset for the kitchen. 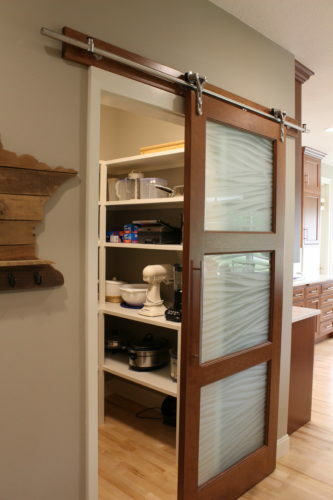 The walk-in pantry sports a patterned glass door that allows natural light but doesn’t display all the kitchen staples. The end result of the Swoopy Island kitchen is a space that is much greater than the sum of the rooms that it once occupied: more connectedness, more function, more storage, more light, more view.